Perhaps I could change places? In the coolness of a name? Ah, to be Zheng, words like water! ‘Folded in a loose shirt’. Or her point in space. From the glass that I call mine. Despite the fact that it is the eve of Chinese New Year, almost the same number of regular audience came to the Kubrick Poetry. My worry soothed away when I saw the old and new faces. 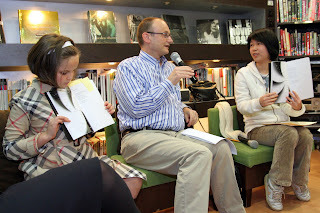 Our guest poet, Michael Holland, came from Australia and has been living in Hong Kong for 10 years with his family. Metaflora is his first published collection of poems. He also authored other books, such as the Art of English, Craft of English, etc. He is the editor of the Heinemann Australian dictionary. 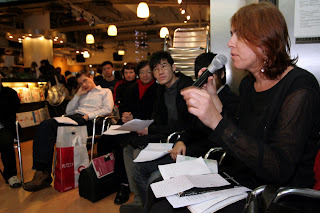 Metaflora is a written over the eight years he lived in Hong Kong and the theme centre memory, identity and language. Before the Kubrick poetry event, Michael wrote in response to Victor’s comment on the website that he writes his poems in iambic form. 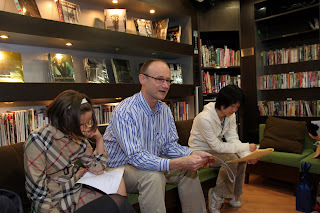 “Iambic poems often have variations in which the trochee and other stress patterns occur.The poems are different: you can see iambic feet used in the poem ‘Inside’.” I asked Michael to explain how he applies the iambic form in his poem writing to the audience. He then read the poem “Recession” and explained that “Recession” uses trochees to begin the most lines. The initial stress is to excite and surprise the readers. “Rhyme comes before words.” Michael further said. He does not intend to make his poem rhythm, instead the music of the words comes to his mind before any word is written down. Victor amazingly exclaimed that Michael’s idea of rhyme is in accord with TS Eliot’s theory. 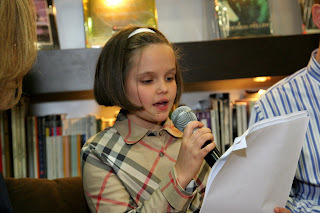 The poem “Thread Golden” is written for his dear daughter Amelia and Amelia read the poem herself in the presence of all the audience with her pure voice. Madeleine read the Cento that she did for Michael’s book launch in December in Fringe Club. She picked the favourite line of every poem in his book. There are altogether 26 poems, thus, 26 lines. Needless to rearrange the order, the lines already make another meaningful poem. I translated two short poems into Chinese for our Chinese readers. This is my first attempt to do poetry translation. 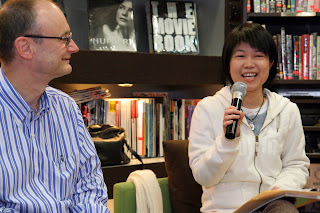 I must thank the literary translator Mr Huang Canran for correcting my mistake. Michael’s poetry gathered us together on the eve of the Chinese New Year before we went home for the traditional dinner that every Chinese valued. Warmth filled the air and rhythm vibrated in the heart of the audience when the Kubrick poetry ended.